+ Gov't Mule, DJ Mustard, and more! Is there anything better than partying for a good cause? We think not. That's why one of our favorite fests in the game, McDowell Mountain Music Festival, is changing how people think about live music events. Since 2004, the three-day non-profit celebration has brought some of music's biggest names to Phoenix, Arizona to integrate and support the local community. The mission? Rally the masses to give back to the arts and the underprivileged. This year's lineup was just announced and the artists slated to perform next March 3-5 in Phoenix, AZ are a doozy to say the least. From The Shins to Bob Moses to Flume, the acts featured hit home for any music lover. With proceeds going to two different charities, Phoenix Children’s Hospital Foundation and UMOM New Day Center, this is going to be an event that you definitely don't want to miss. Check out our list of the top can't-miss acts for next year, listen to our playlist to get you hyped, and then make sure to track the artists so you don't miss them when they're in a city near you! Get your tickets to M3F here. It’s hard to believe that Australian music producer Flume has only two albums under his belt, considering that the electronic powerhouse’s resume boasts some seriously impressive collaborations (Tove Lo and Nick Murphy—previously Chet Faker). The artist has definitely made a name for himself. With the unparalleled ability to breathe new life into his remixes (see: Lorde’s “Tennis Court”), it’s really no surprise as to why the music industry is obsessed with him. Flume will be bringing his signature blend of electronic infused trip-hop to the McDowell festival stage, and we couldn’t be any more stoked. Who can forget The Shins?! With hits like “New Slang” and “Caring is Creepy” dominating MySpace profiles and film soundtracks in the early '00s, this alternative pop-rock band is finally back. We know you’ve been waiting for new music by the Portland group (fronted by James Mercer since their start in 1996) and lucky for you, I Gleek On Your Grave, will be released in early January—just in time for you to see some new songs performed live. With no accompanying tour announced yet, this could be the best opportunity to make all your friends insanely jealous. Who says that disco is dead? Canadian duo, David "Dave 1" Macklovitch and Patrick "P-Thugg" Gemayel, more commonly known as Chromeo, infuse the genre with contemporary productions, creating a sound that’s all their own. Blending electronic, funk, nu-disco, and synthpop, this duo has been churning out jams for the past twelve years. We’re hoping for a set that includes songs from all four of their studio albums, and maybe even some new ones (we can dream, right?). 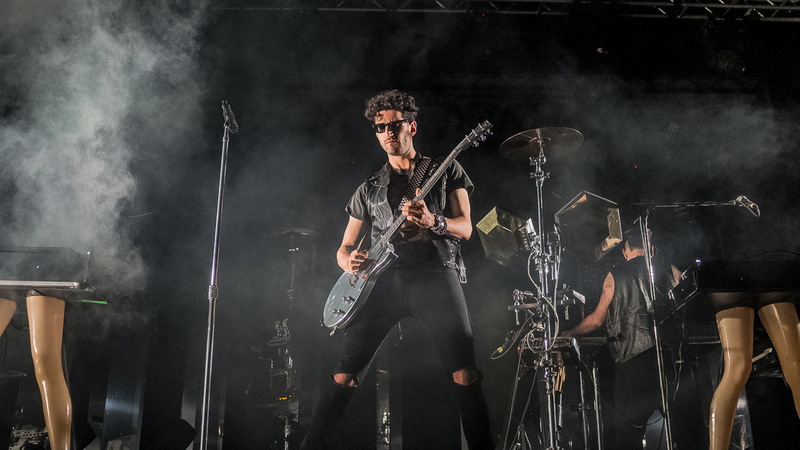 One thing is for certain, though—Chromeo at a festival is bound to be a good time. An appearance by Grouplove on any festival roster is cause for celebration. After all, their 2011 hit, “Tongue Tied”, is all about having a badass time with your best friends—what could be more festival-centric? This past September, the four-piece released their third album, Big Mess, and we can’t wait to hear the new upbeat, feel-good tracks performed live next March at M3F. Gov’t Mule’s legendary southern rock jams have been igniting a fire in our hearts since 1995 with the release of their debut self-titled album. Since then, Warren Haynes (of Allman Brothers Band fame), Matt Abts, Danny Louis, and Jorgen Carlsson have recorded hit after hit, leaving their fans hungry for more with every album they release. After dropping, The Tel-Star Sessions, this past summer—an archival album originally recorded as their debut—you can bet this four-piece will be ready to rock the stage with both old songs and new. With hits like, “Rack City”, “Headband”, “Oh Na Na”, and Jeremih’s “Don’t Tell ‘Em”, DJ Mustard's producing style has proven to be one of the best and most prestigious in the music industry. Dijon McFarlane continues to keep his name at the top of everyone’s playlists with his work on hit singles, but he has also received praise from his own album, Cold Summer. You might have caught his DJ skills when he opened for Rihanna earlier this year—making the ultimate warmup for his festival performance next March. If you didn’t have the chance to catch Bob Moses at once of their many festival dates last year, McDowell Mountain Music Festival is your chance to make it happen. Ever since stepping into the music scene, former high school buddies, Jimmy Vallance and Tom Howie and have been attracting audiences of both the electronic dance world and the songwriting world and have meshed them into one united fanbase who know all about how exciting their live performances can be. Now, you get to be one of them. When a really good funk-focused band is set on a festival lineup, you know you can’t miss them. Providing electric grooves, a place to dance, and good vibes, Kevin Donohue, Andrew Clymer, and Chris Anderson of Sunsquabi are a can’t-miss. Having rapidly made their name known in the electronic dance world by creating a liberating experience for their fans through their music, we can’t wait to catch hits like, “Squabcat”, “Odyssey”, and “Tequila Mockingbird” live in Phoenix. Breaking into the music industry for an actor can be a tough sometimes, but this was not the case for Hayley Kiyoko. The “Cliff's Edge” songbird’s Hollywood career consisted of some notable appearances in Disney Channel programs like Lemonade Mouth and Wizards of Waverly Place, but has since traded life on the small screen for a life in the pop scene. The synthpop musician made her big debut with the release of her second single “Girls Like Girls” back in 2015 after the video accompanying it went viral on Tumblr. We’re super excited to catch this budding musician bless us with her unique brand of synthpop in the flesh. Whether or not you’re familiar with the genre of red dirt, Whiskey Myers will be sure to fill you in. Named after Stillwater, Oklahoma's soil color, artists like Jason Boland & The Stragglers, and Randy Rogers Band, and Reckless Kelly reign the southern rock-bluegrass combo style of music. After touring with Shinedown and Halestorm this past summer, the quintet from Tyler, Texas wowed audiences with their insane guitar solos, and tracks that double as both “rebel music” and “everyday soul” according to Whiskey Myers’ Facebook page—both really good reasons to check out their live set. Between the buzz for their music video for, “Approximately 906 Miles”, and performing at Bernie Sanders’ rally in his home state of Vermont, Harrison Fjord have had one crazy year—and it’s about to get even crazier. These seven friends are keeping their insane momentum going in the psychedelic-rock world of music as they record their first full length album (title has not been announced yet). Now, they’re scheduled to perform at McDowell Mountain Music Festival for hundreds of people—who we know will fall in love, just like we did.